Attention, fellow seed swappers: it’s mid-March, and that means it’s time to pull out all those amazing seeds you got at Seed Swap (what a fun day!) and start growing transplants indoors. My “aha!” moment at Seed Swap happened when I stopped by at horticulturist Lisa Hilgenberg’s seed-starting table, and picked up a copy of her Seed Viability Chart. It’s not only a useful tool about the average “shelf life”—or viability—of veggie seeds, but also an eye-opening reminder to check the dates on seed packs before I start growing this spring. Some seeds last longer than others! Anticipation is running high for Seed Swap! 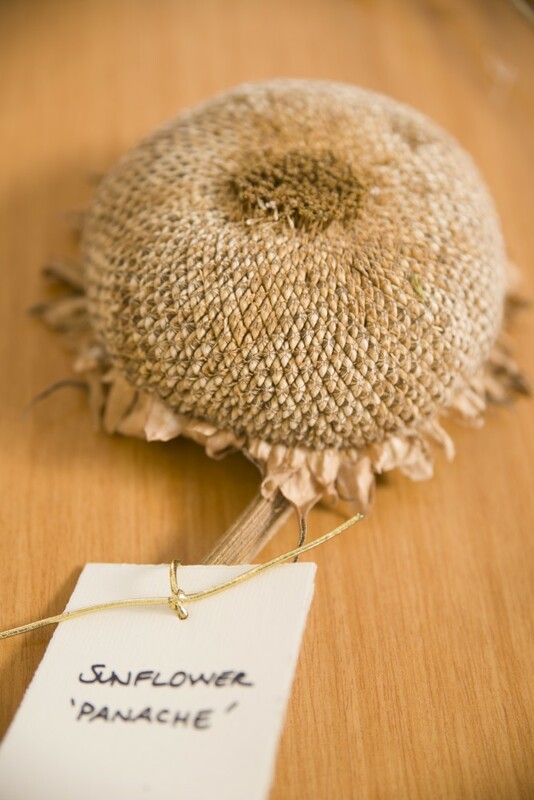 Panache sunflower (Helianthus annuus ‘Panache’) shown in its native seed packet. It’s always a fun day with a community vibe, as Chicago area gardeners gather to swap seeds, stories, and green-thumb tips. A special bonus of 2014: keynote speaker Ken Greene (founder of the terrific Hudson Valley Seed Library) will be available during the swap to answer questions and offer “sage” seed-starting advice. 1. Quality seed starter. Give your seeds a healthy jump start by planting them in a really good seed starting mix. Don’t skimp on quality here—plants grown in inferior mix will never perform like those grown in a high-quality medium. Some adjectives that should describe the product you buy: sterile, fine-grained, free-draining, fluffy, uniform. One brand we’ve had success with: Black Gold. 2. The back of the pack. It’s a simple step that can make a big difference: read the back of the seed packet before you sow. It’s full of important and helpful information—often spelled out in great detail—such as planting depth, days to germination, and watering requirements. Save the seed packs after you sow, too, since there’s often valuable transplant and harvest info there as well. 3. D.I.Y. pots. You don’t need a fancy setup to start seeds. D.I.Y.ers can make their own paper pots; recyclers can put egg cartons to good second use; and the organically minded can replace plastic with peat or compost pots that go straight into the ground and disintegrate as the season progresses. Reusing last year’s plastic pots? Wash them out thoroughly and rinse in a 10 percent bleach solution to knock out fungus and residues before filling with starting mix. 4. The right light. A strong light source is crucial for stimulating plant growth. Without it, plants turn leggy, making them weak and more susceptible to breakage. Consider full southern window exposure as a mere starting point—even better is a grow light that can be raised with the plant’s height, while offering the 12 full hours of strong, even light that seedlings need. Beans sprouted in dampened paper towel. 5. Self-watering system. Started seeds in years past, only to have them dry out and wither before you know it? You may be a candidate for a simple capillary mat/self-watering system. After filling pots with seed starting mix, set them on the specially-designed mat/tray—fill the tray with water, which the mat draws up to the pots, keeping them properly moist without being waterlogged. The system is a boon to those who can’t water every day; an optional lid helps keep humidity high. They’re available at many nurseries and online. At Seed Swap, Garden experts and master gardeners from our Plant Information Service desk will be available to chat, but we’ve found that the best way to get an answer is also the simplest and most satisfying: turn and ask the gardener next to you. Looking forward to seeing you at the swap! 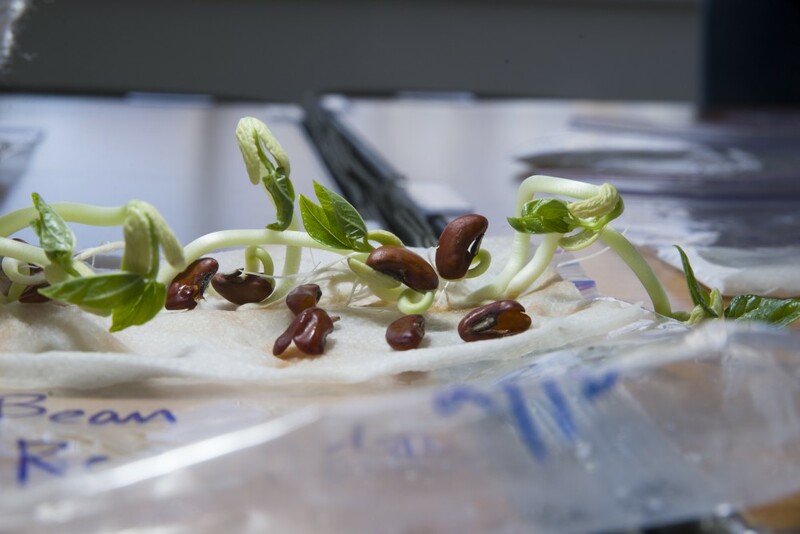 Blayne Greiner, Instructor for the Chicago Botanic Garden’s Windy City Harvest urban agriculture program, gives us some tips from his recent class on seed starting. A lot of information was covered in this 3-hour workshop, so if this video still leaves you with questions, consider taking these courses. Visit chicagobotanic.org/windycityharvest/courses to sign up for the next one. In case you missed it, here’s the recipe for blocking mix: 30 quarts brown peat, 20 quarts compost, ½ cup lime, 20 quarts coarse sand or perlite, 10 quarts soil, 3 cups organic fertilizer mix (blood meal, colloidal phosphate and greensand mixed together in equal parts). The Garden’s production staff and volunteers are busy making sure the spring annuals and vegetables are ready to be planted in the display gardens in the next couple weeks. Tim Pollak in the Chicago Botanic Garden’s Production Greenhouses shows us what they’re up to and how we can grow cool season vegetables at home to get ready for spring in our own gardens.